Mother’s Day is only a few days away but there is still time to arrange and book an extra special gift for your mum. We believe DUKES LONDON is the perfect venue to truly spoil your mum this Mother’s Day and our Afternoon Tea is a luxurious treat that she will love. Here at DUKES LONDON, we have been celebrating the achievements of women throughout March with our dedicated Duchess Month. As a hotel led by female management, we are proud to recognise the wonderful women throughout the world and share in their successes. This special month will draw to a close with the most wonderful of occasions – Mother’s Day. Mother’s have such a special and important role in our lives and this day gives us the chance to acknowledge everything they do for us. Booking an Afternoon Tea treat at DUKES LONDON is the perfect way to spoil your mum and say ‘thank you’ for the sacrifices she has made. 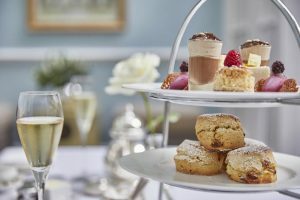 Both your mum and you will be served a selection of delicate finger sandwiches, freshly baked delicious scones, and a selection of heavenly cakes and pastries. The delightful food will be complimented by a selection of loose-leaf teas and infusions from around the world. Served in our elegant Drawing Room and Conservatory, the setting is perfect for a relaxed Sunday afternoon in luxury. Why not add a glass of champagne to truly celebrate the occasion? If you are looking for something more unusual, our MarTEAni Afternoon Tea is the perfect choice. This Afternoon Tea experience combines two of DUKES LONDON’s most famous offerings. You will be served three beautifully presented martinis, each crafted by the DUKES team using The East India Company Gin. Each drink is perfectly paired with each course of the Afternoon Tea. The exotic flavours include: Black Pepper & Citrus, Victoria Plum, and Spiced Karak Tea. Read More: Why is DUKE’s Bar such an iconic part of London? Any bookings made throughout the month of March will also be entered in to a special prize draw to win a day spa package for two in our Health Club. There definitely isn’t a better time to spoil your mum at DUKES LONDON. Book your Mother’s Day Afternoon Tea now before spaces are filled. BOOK NOW online, call +44 (0) 207 491 4840 or email [email protected].